By Colvinex. US Navy Bureau of Aeronautics M456 24 volt electrically heated leather flying suit re-tailored as a flying jacket. Size 42 (measures approximately 22.5" from pit to pit). Originally this was a one-piece wired goatskin leather flight suit with full length leg zips and another zip from waist to neck. 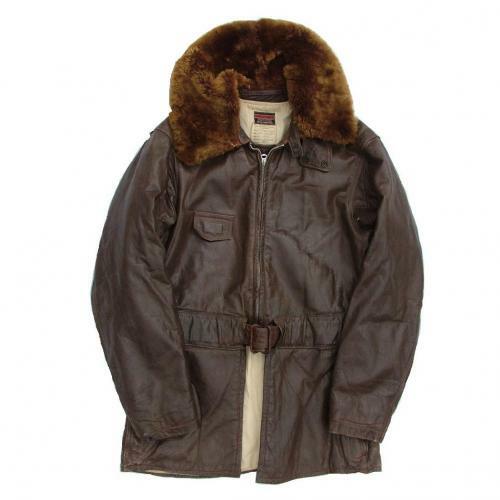 It has a large collar faced with mouton fur, integral belt and knitted cuffs. The suit was worn with heated gloves and boot liners etc. This example has been carefully re-tailored into a useable flight (or other) jacket. The legs have been removed leaving a generous 'skirt' section below the belt to cover the waist and upper thighs. This has two integral pockets with original Talon zip fasteners. Overall condition is very good, the leather is beautifully soft and supple and retains excellent original chroming. The main 'Talon' zip is original to the suit and in very good order. The leather covered belt buckle show wear and the collar has minor fur loss in places. Both knitted cuffs have some holes but are in fairly good overall condition. The cotton lining is good. With original woven/printed labels, leather hanger and collar strap. An interesting vintage jacket. Stock code J21316.